'Sooner or later every chess player faces the problem of building his or her opening repertoire. This is particularly difficult when you play with White, since you need to be well prepared against all of Black's possible responses. However, most players, including the author, have no inclination to devote all their time to studying opening variations. Therefore, we have decided not to cover the favourite opening move of Ostap Bender * - 1.e2-e4. The first book is devoted to the move 1...d7-d5 for Black. I believe that the most challenging defences for White to face are the Queen's Gambit Accepted (Part 2), the Queen's Gambit Declined (Part 4) and the Slav Defence (Part 5). A few less popular options for Black are covered in Parts 1 and 3. In the second book we shall deal with the openings in which Black fianchettoes his dark-squared bishop. These are first and foremost the Gruenfeld and the King's Indian Defence. In book three we shall analyse in detail the Nimzo-Indian Defence and a few other defences not covered in our first two books. 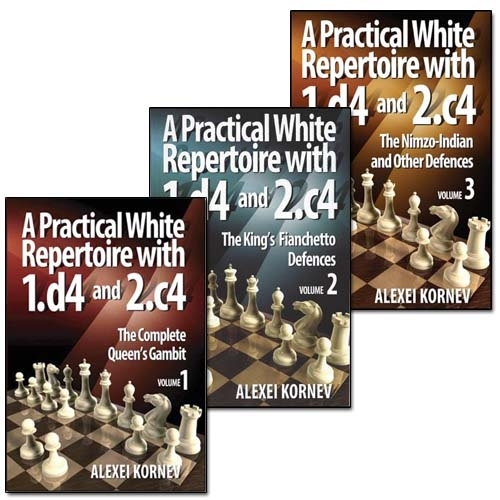 Alexei Kornev is an international grandmaster and coach. In 2001 he took the silver in the Russian Cup Final. He is also the winner of a number of international tournaments. His highest Elo so far was 2582. For many years, he has been senior coach of the junior chess school in the city of Vladimir. His students are often among the winners of the Russian junior championships for boys and girls. "A Practical Black Repertoire with d5, c6. Volume 1: The Slav"
The links for black repertoire are not working anymore. Could you upload them again please? Thanks to Gambit_man and to the other uploaders!